Space shuttle Discovery's STS-133 crew arrives at Kennedy Space Center on Oct. 28, 2010 ahead of their planned Nov. 1 launch - the last flight of Discovery. From left: Nicole Stott, Michael Barratt, Tim Kopra, Al Drew, Eric Boe and Steven Lindsey. CAPE CANAVERAL, Fla. ? The six astronauts who will fly on spaceshuttle Discovery during its historic final flight have arrived at theirFlorida launch site for the planned Monday launch, after a slight delay due toan aircraft glitch. ? Discovery commander Steve Lindsey and four of his crewmates beganlanding their NASA T-38 jets here at the Kennedy Space Center at about 3 p.m.EDT (1900 GMT). A plane swap for the sixth crewmember, mission specialist AlvinDrew, delayed his arrival by an hour. "It?s great to be down here ? what an excitingweek," Lindsey told reporters who had gathered for the crew's arrival. "Hopefully, weather permitting, all goes well and we'll have a nice Nov.1 on-time launch. We're looking forward to it." On its 11-day mission, Discovery will haul critical spareparts to the space station, including a storage room and a humanoidrobot to assist the crew of the orbiting laboratory. It will be the 39thand last space voyage for Discovery before NASA retires is shuttle fleet nextyear. Lindsey, pilot Eric Boe, and mission specialists MichaelBarratt, Nicole Stott and Tim Kopra flew in on three of NASA's supersonic T-38 trainingjets from their the Johnson Space Center in Houston. Drew's arrival was delayed about an hour, after issues withhis T-38 aircraft forced him to return to Houston to switch planes. He toucheddown at the Florida spaceport at approximately 4 p.m. EDT (2000 GMT). Lindsey also expressed gratitude to the teams at KennedySpace Center who, just last weekend, completed a speedy repair on two leakyseals that were found on Discovery's fuel line. "They did a fantastic job getting the vehicle ready forus," Lindsey said. 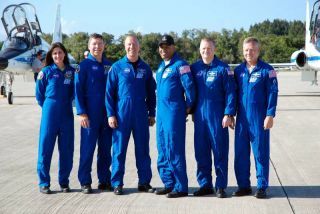 The STS-133 crew is scheduled to launch Monday at 4:40 p.m.EDT (2040 GMT) to the International Space Station. In the remaining days before launch, the astronauts willremain in medical quarantine ? a standard precaution ? to prevent illnessbefore the mission. They will also spend the next several days reviewingmission details and completing last-minute training exercises. The official countdown for Discovery's launch will begin tomorrow (Oct. 29) at3 p.m. EDT (1900 GMT). NASA is retiring the three remaining shuttles in its fleet ?Discovery, Atlantis and Endeavour ?to make way for a new plan aimed at sendingastronauts to visit an asteroid and Mars. Discovery is the oldest of NASA'sspace shuttles. The bill also calls for a budget of $19 billion for NASA in2011, adding one extra space shuttle flight before the fleet retires for good,and the extension of the International Space Station through at least 2020. Follow SPACE.com Staff Writer Denise Chow on Twitter @denisechow as she covers Discovery'sfinal space voyage from Cape Canaveral, Fla.. Click here for mission updates,new stories and a link to NASA's live webcast coverage.